Times are changing here in Ontario. I have been proud to call myself a farmer, though some would say, not a good one, but in any event, happy to be involved in an occupation that has always been held in great reverence by the citizens of this country. 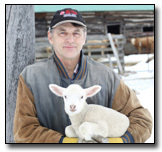 For the most part, people still trust farmers and look up to them as “the salt of the earth” for their work ethic and the quality food that they produce for their neighbours to put on their tables. Now I know if you ask some students in town where food comes from, they may answer “from the store”, because society is becoming more and more removed from the earth where all of our subsistence is derived from. The pride of all farmers took quite a hit a couple of weeks ago in an Ottawa courtroom when MNR officer Ridley testified in a case concerning a farmer who had been charged for operating a ‘slaughter plant’ and not having animals government inspected before and after slaughter. In this case, the farmer sold lambs to people who then asked if they could slaughter the animals on-site, ‘in the yard’. This was not something new since this group of people has bought lambs from this farmer for more than 25 years without incident. This is a practise that takes place all over the world, every year, since time began, as it has in Canada, and continues here today on small farms, where friends help out and take home some of the spoils of their labour, as payment. I myself, have been selling rabbits, chickens and lambs to people from all walks of life and ethnicities for more than 40 years. These people want to inspect the animal before it is slaughtered and then do the job themselves, to make sure that it is done right for their families’ sake. Looking ahead to some future day when stores don’t have food, people want to pass on that survival skill to their children and our society is stronger and safer when we have people keeping these heritage skills alive. Getting back to the court case. So the MNR officer did not charge the folks that bought the lambs and did the slaughter, but charged the farmer. When asked why they charged him even though he did not participate, the officer said it was the same as with ‘drug raids’, they charge the drug dealer not the customer. So you see, he has equated a farmer who has sold a legal product to a drug dealer. If the farmer had sold him that lamb and they put that ‘live lamb’ in a box in the back of their van, there would be no problem, since it is a legal product. Or if the farmer gave permission for a hunter to kill a deer, a turkey, a goose or a rabbit on his farm, there would be no problem and no pre-slaughter inspection, no post-mortem inspection and no sanitary inspections of the facilities (that of course, being the ground where the animal fell) which is sort of equivalent to the ground in a farmer’s yard where they killed the lamb. This equating of a farmer to a drug dealer has far reaching consequences for the future of all rural activities whether it is raising your own food animals or hunting and fishing for the ‘table’. If any of these activities are allowed to be depreciated, it will not take long before some ‘turkey’ with a newly revised rule book, removes the right for all people to source their own food.